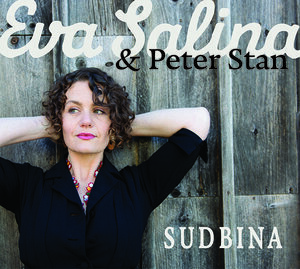 Eva Salina pulls from the past on Sudbina, a gripping tribute to late Serbian Roma singer Vida Pavlović. You could be forgiven for not recognizing the name Vida Pavlović. A Serbian singer with Romani roots, her legacy is primarily one local to the bars of former Yugoslavia, her last album a 1986 release, her death in 2005 a premature one. Deep in the Eastern Bloc, though, three or four decades ago, Pavlović was a hidden treasure buried in the Balkans, a woman who maintained vital Roma music styles with a gripping voice and powerful emotion. Years later and a continent away, enter Eva Salina. Brooklyn-based, she has teamed up with Serbian-Romanian accordionist Peter Stan to pay tribute to Pavlović on the album Sudbina: A Portrait of Vida Pavlović - and the results are darkly glorious, an exploration of what it means to honor the past without glossing over the melancholy truths of it. It seems an impossible task to match the range of motion of Pavlović's voice, but Salina does, melisma for melisma. And, while it's futile to compare perceived intent between two singers from an outside perspective, Salina sounds as sincere as she possibly can with another singer's repertoire. Stan, meanwhile, is a true virtuoso in every sense of the word, his instrument a nimble partner to Salina's. Rarely has a squeezebox sounded more genuinely moving. Stripped-down arrangements of each song allow for a far more effective demonstration of strength than anything lusher likely would, and such impact is fitting. These are songs about poverty, about abuse, about the trials of a life lived as a Roma woman. On arresting opener "Pusti Me Da Živim", Salina's voice is one full of sorrow, Stan's accordion responding with its own brightly weeping notes. From the daily battle scars, though, comes a hard-earned strength, the likes of which come forth in tracks like "E Laute Bašalen Taj Roven", a melancholy march that alludes to purges of Roma in the Holocaust and still has relevance to the hardships the stateless Roma nation faces today. Another track, "Aven, Aven Romalen", serves as a rallying cry to the Roma; on it, Salina's voice is perhaps at its most grounded, and somehow at its most optimistic, as well. One more instrument comes in at the end of the album: the masterful trumpet of brass band leader Demiran Čerimović, whose duet with Stan on "Ostala" pays the album's final respects to Pavlović and the larger world of Roma music of which she continues to be such a noteworthy part. Čerimović takes center stage here, his instrument moving quickly while Stan holds down a steady foundation. On the song "Ostala Je Pesma Moja", Pavlović once wondered what would become of her music when she was no longer there to sing it. Thirteen years after her death, Eva Salina echoes the concern back across a temporal canyon and, simultaneously, sends it forth into the future, answering Pavlović's question while reminding her listeners of the unknown next steps in perpetuating a heritage like Pavlović's. If nothing else, Sudbina - an album whose name means "destiny" or "fate" - proves that Pavlović's songs still resonate with an enchanting musicality.